This article is about the church in Barcelona. For other uses, see Santa María del Mar (disambiguation). Santa Maria del Mar (Catalan pronunciation: [ˈsantə məˈɾi.ə ðəl ˈmaɾ], "Saint Mary of the Sea") is an imposing church in the Ribera district of Barcelona, Spain, built between 1329 and 1383 at the height of Aragon kingdom's maritime and mercantile preeminence. It is an outstanding example of Catalan Gothic, with a purity and unity of style that is very unusual in large medieval buildings. The first mention of a church of Santa Maria by the sea dates from 998. The construction of the present building was promoted by the canon Bernat Llull, who was appointed Archdean of Santa Maria in 1324. Construction work started on 25 March 1329, when the foundation stone was laid by king Alfonso IV of Aragon (III of Barcelona), as commemorated by a tablet in Latin and Catalan on the façade that faces the Fossar de les Moreres. The architects in charge were Berenguer de Montagut (designer of the building) and Ramon Despuig, and during the construction all the guilds of the Ribera quarter were involved. The walls, the side chapels and the façades were finished by 1350. In 1379 there was a fire that damaged important parts of the works. Finally, on 3 November 1383 the last stone was laid and on 15 August 1384 the church was consecrated. The 1428 Catalonia earthquake caused several casualties and destroyed the rose window in the west end. The new rose window, in the Flamboyant style, was finished by 1459 and one year later the glass was added. Many of its decorative richness, the images and the Baroque altar were destroyed in a fire set by anti-clerical rioters at the beginning of the Spanish Civil War in 1936. The church survived even though it was on fire for 11 days. The chapel of the Blessed Sacrament, adjacent to the apse, was added in the 19th century. Some interesting stained-glass windows have survived from various periods. The spacing of the columns is the widest of any Gothic church in Europe—about forty-three feet apart, center to center. According to the art historian Josep Bracons, the basic unit of measurement used in Santa Maria del Mar was the mediaeval foot of 33 centimetres. Measured in this way, the side chapels are 10 feet deep, the width of the side aisles is double this, while the central aisle is four times as wide, that is, 40 feet. The total width of the church is thus 100 medieval feet, which is also equal to the maximum height of the building. ^ "Arquebisbat de Barcelona: Parròquia de Santa Maria del Mar". Retrieved 7 March 2013. ^ Hughes, Robert (2011-12-07). 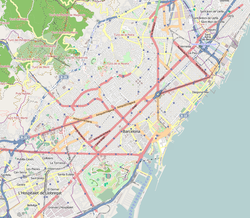 Barcelona (Kindle Locations 2833-2834). Random House, Inc.. Kindle Edition. 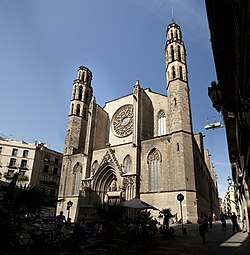 Wikimedia Commons has media related to Santa Maria del Mar.